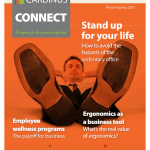 Ashley Clabeaux from the Workers’ Compensation team at Adventist Health shares her review of the Cardinus ergonomics program from implementation to (spoiler alert!) outstanding outcomes. Adventist Health is a hospital system covering California, Hawaii, Oregon and Washington that encompasses twenty hospitals with nearly 20,000 employees. Its Workers’ Compensation and Safety Department implemented the Cardinus ergonomic online assessment and training program for its deskbound workforce. Due to an increasing trend in carpal tunnel syndrome (CT) and related repetitive movement injuries in office workers, the Workers’ Compensation and Safety Department faced increasing costs in complying with California’s occupational health and safety requirements. For each CT-related injury claim filed, Adventist bore the expense of a job analysis and investigator in addition to the cost of paid disability leave, plus the risk of losing insurance from an existing carrier due to excessive claims. Initially, Adventist deployed two full-time ergonomists to work with offices in the field, but demand exceeded capacity. Thus, Cardinus’ online self-guided ergonomic assessment and training program was deemed a better fit for Adventist’s dispersed workforce. Cardinus provides online education, training and assessment to shift thinking around pain and MSD, trains employees in proper postures for their workstations and emphasizes habits such as moving around the office, to foster better musculoskeletal health. Senior leadership was easily convinced to invest in the Cardinus implementation due to its relatively low cost, especially compared with the cost and toll of increasing CT injuries. However, managerial buy-in was more difficult once implementation began – not unusual given the unfamiliarity with the program, difficulties among most organizations in rolling out new programs, and the need for effective communications for sustained employee engagement. The Workers’ Compensation and Safety team visited all Adventist sites to familiarize managers with the program, encourage their own engagement and foster promotion to line staff. These in-person visits combined with a robust communication plan and new hire training resulted in increased buy-in and engagement. Of the 1,300 Adventist employees eligible to participate in the Cardinus program, the initial engagement rate was a high 75%. Since implementing the Cardinus program in 2014, Adventist has experienced a decrease in the number of reported CT-related injuries each year, and the Workers’ Comp team expects positive returns to continue. Using Cardinus’ proprietary risk score, the number of individuals at Adventist deemed to be at high risk for MSD has been cut in half over two years. Now we’re experts in workplace ergonomics. We’ve gained the respect of employees who appreciate the program and now trust the Workers’ Compensation department.